Child maltreatment is preventable and requires a comprehensive approach at the primary, secondary, and tertiary prevention levels. Many public health programs to prevent child maltreatment promote protective factors that shield children from maltreatment. 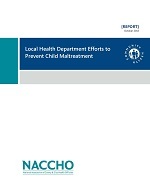 Local health departments recognize that child maltreatment does not happen in a vacuum and often connect parents and caregivers to social services and supports that help mitigate risk factors for child maltreatment, such as young parental age, inadequate housing, substance abuse, and mental health problems. This report provides an overview of the current state of child maltreatment in the United States and highlights evidence-based public health programs and services in local health departments to reduce child maltreatment.